If there’s one thing Google’s never failed at, it’s search. Googling has, after all become synonymous with performing a web search. As such, it’s not all that surprising that it’s something of an authority on the subject. In celebration of this, Google has released a video chronicling the evolution of its online search products. According to the official blog post the video is posted in, it highlights “some of the most important milestones from the past decade—and a taste of what’s coming next”. The six-minute-long video takes viewers right back to the early days of online search, when Google was just Larry Page and Sergey Brin’s university research project. From there it highlights each milestone reached by Google’s search function, every passing mark explained by a senior Google staff member. Everything is there, from the ingenious search algorithm that first attracted the world’s attention, through adwords — the first feature to earn it revenue — all the way to Google Instant and beyond. Among the ideas suggested for the future is Star Trek-like search function, fully capable of understanding every nuance of human of speech. While the video is predominantly concerned with the most visible evolution of Google’s flagship product, the company notes that most users are unaware of some of the biggest changes affecting search. According to the search giant, this is deliberate and all implemented with the goal of getting “you to the answer you’re looking for faster and faster, creating a nearly seamless connection between your questions and the information you seek”. 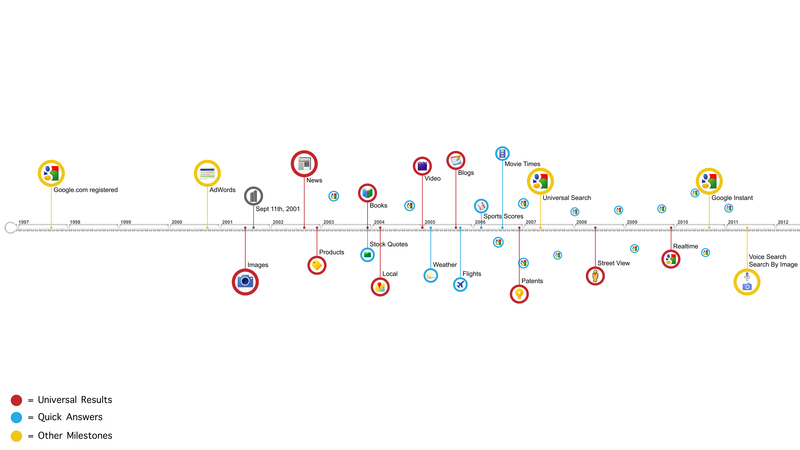 Along with the video, Google has released a graphic timeline showing some of the important milestones featured in the video as well as some that were left out. Google Fellow, Ben Gomes, claims that the company is “thrilled about the future of search”.